Hello all! I was suffering from a severe case of boredom an figured I would see if youtube could lighten the mood a little when I stumble across this masterpiece. The guys over at smosh really out did themselves this time lol. It’s brilliant, just brilliant! 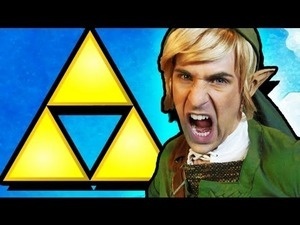 I’ve watched alot of videos that smosh has done over time but this one by far takes the cake. If your a video game fan and you enjoy this video, be sure to check out their ‘Pokemon in real life videos”! C’mon… you know deep down inside you still love Pokemon. 24 Nov	This entry was written by KinderGardenCop and published on November 24, 2011 at 6:32 PM. It’s filed under artsy, Awesome, Games and tagged fairy, g unit, ganondorf, Hey!, hyrule, master sword, navi, Nintendo, parody, rap, Zelda, zelda rap. Bookmark the permalink. Follow any comments here with the RSS feed for this post.